The Nashville Predators were featured in rumors for some star players, the big one being Erik Karlsson. As the trade deadline came to an end, Karlsson wasn’t on his way to Tennessee, and instead, Ryan Hartman was. Mike Fisher will join Hartman as the only additions to the 2017-18 Predators, and honestly, that’s fine. The deepest forward corp in Nashville history just got deeper, and better. So with the trade deadline additions, let’s take a look at a bolstered Predators roster, and what the lines will most likely look like. To the surprise of no one, the first line will remain Filip Forsberg, Ryan Johansen, and Viktor Arvidsson. The line known as JoFA has been dominant as of late, especially since the new year. While Forsberg has cooled off since his hot start, Arvidsson has been scorching over the last few games. His success may be directly linked to Johansen, but it’s still nice to see the little Swede pot a few goals. The trio is one of the most dominant in the NHL, and they’ll be expected to play as such. While players get hot and cold throughout a season, this line will need to be sizzling come April. Kevin Fiala has been a man on a mission so far this season, he’s carried any line he’s on and has looked dominant. I suspect he’ll lead the Predators in goals for many years to come, and could possibly crack the 30-goal mark this season. He’s joined by Kyle Turris and Craig Smith. Smith has seen a revitalization of his career, and even though his numbers have gone cold recently, his play has still been great. The line has received some incredible sheltering in terms of zone and competition though, so the disappearance of that might affect their numbers. This line has great chemistry and shouldn’t be broken up unless the Predators go ice cold. I think Ryan Hartman would fit in well as a net-front presence or a stand-in for Smith. That would also help make the third line a bit faster. Otherwise, just let the Turris line work their magic. Here’s where things start to change. The current third line is Scott Hartnell, Nick Bonino, and Calle Jarnkrok. This has been one of the more efficient scoring lines for the Predators since their combination. I don’t expect them to stay together though, as Hartman is a prototypical middle-six physical player. So here’s what I’m thinking, Hartnell-Bonino-Hartman. This would be a physical, defensively responsible third line. They would be tough to play against in the corners and could wear down the defense for the Predators’ top six. Hartnell might look slow compared to the two, but he could be moved down or even sat for a game to rest his legs. Now we have to start cutting people. Here is what I think the fourth line will be, but keep in mind that it’s not what I would want. 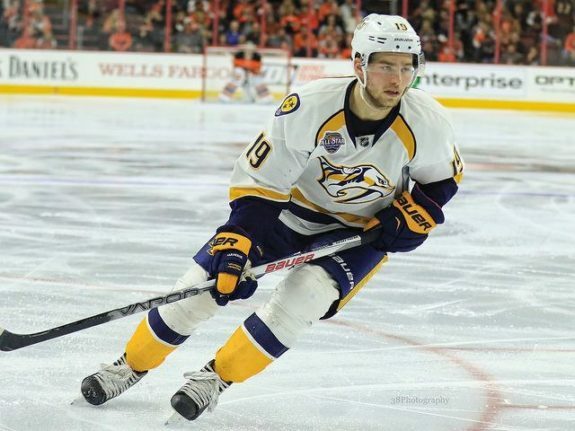 The fourth line will probably be Austin Watson, Colton Sissons, and Calle Jarnkrok. This line is a bit of a wild card, as far as their composition. I originally thought Peter Laviolette would replace Salomaki with Mike Fisher, but Fisher is a right-handed shot and Salomaki is not. Laviolette likes to have his lines balanced with lefties on the left, and righties on the right. Otherwise, I could totally see a line of Fisher, Sissons, and Jarnkrok, as Laviolette also loves his centers. It’s a bit of a hot mess with so many different options that I’m not sure I can accurately predict it. Instead, I’ll lay out my preferred fourth line. It’s not a flashy bunch, but I think Salomaki, Jarnkrok, and Watson would be great together. This has been a shutdown line for the Predators in the past, and they’ve dominated some tough competition. They could easily negate an opposing team’s second line so that the Turris line can play against a third or possibly fourth line. Although, that does leave some players on the bench. So who’s left on the bench? If we’re looking at who’s left realistically, it’s probably Fisher and Salomaki. Which isn’t bad, as you have a left-handed shutdown winger and a right-handed shutdown center ready in case of injuries. You could even do a floating rotation till the playoffs to keep guys rested, even though it’s heavily looked down upon by the rest of the NHL. In my perfect world, the healthy scratches would be Sissons and Fisher. Fisher just keeps looking like the odd man out as the Predators finally have more centers than wingers. Sissons is a generic player who only really makes an impact on the power play, but his spot could easily be filled by Hartman. I’m not sure he makes enough of an impact at five on five to keep him in the lineup. No surprise here as Roman Josi and Ryan Ellis will make up this pair. If it ain’t broke, don’t fix it. That said, wouldn’t Erik Karlsson look incredible next to Roman Josi on the top pair? It didn’t happen, but I can still dream. This pair will need to be a bit better in their defensive zone as they have a tendency to pile up high danger chances on both sides of the puck. As the Predators get closer to the playoffs, their defensive contributions are going to matter a bit more. 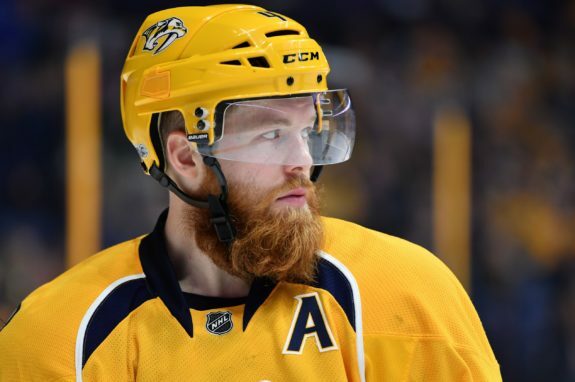 The Second Defensive Pair – Ekholm/P.K. Once again, no one should be shocked to see Mattias Ekholm and P.K. Subban line up together. They create one of the best shutdown pairs in the NHL today, and the Predators should expect nothing short of excellence from the duo. They’ve gotten much better recently at moving the puck in the offensive zone, and that should help them, although they rarely start their shifts there. Subban is known to turn the puck over every once in a while, but fans shouldn’t be too worried about it. His zone exit numbers are so fantastic that the turnover sticks in your brain more than the 100 other times he leaves the zone with possession. Ekholm continues to be a dominating force in the defensive zone corners and in front of the net. The Central Division is loaded with top talent, and these two will be facing the cream of the crop. Once again, the depth is where things start to get a bit different. From the amount of playing time they’re getting, Alexei Emelin and Yannick Weber will likely start the playoffs on the third pair. I can’t disagree that they deserve it over Matt Irwin and Anthony Bitetto, but either pairing is a sore spot for the Predators. If the Predators needed to address any line on the roster, the third pair was the one that needed bolstering. Instead, the Predators paid out the nose for a bottom six winger that will need a new contract after this season. The defense didn’t need a Ryan McDonagh or Karlsson, but it could’ve used a Mike Reilly, Joe Morrow, or Ian Cole. 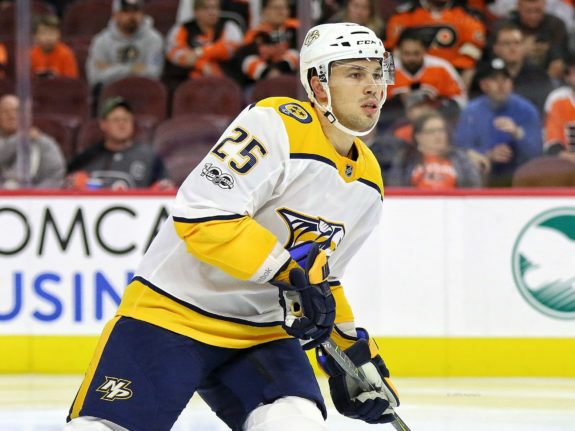 Instead, the Predators have to hope that Alexei “concrete feet” Emelin and Yannick “turnover” Weber can handle 13 minutes a night in the playoffs. Having Weber and Emelin play every night leaves Irwin and Bitteto, as I mentioned earlier. I think both of those players are fine as the next men up to replace a third pairing defenseman. The only issue is that they’re both left-handed, and we know how Peter Laviolette loves to have balance. The Predators basically have two first pairs, and then two pairs of sixth and seventh defensemen. It’s not a great look, but it’ll have to do, unless the Predators call up Alexandre Carrier. Don’t expect that though, as the Predators seem fine with letting him get big minutes in the AHL. 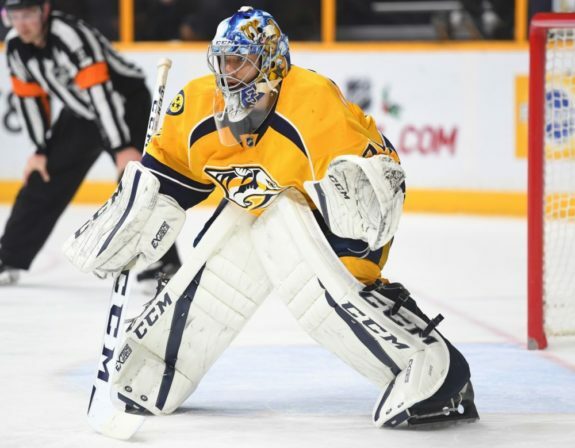 The goalies will be Pekka Rinne and Juuse Saros, which is perfect. Rinne has been Vezina worthy throughout the season, and Saros has been just as good. The only times that these two lose is when the Predators don’t show up in front of them. That’s actually not true, sometimes the Predators win when the team plays terribly in front of them, as both goalies have combined for nine shutouts on the season. 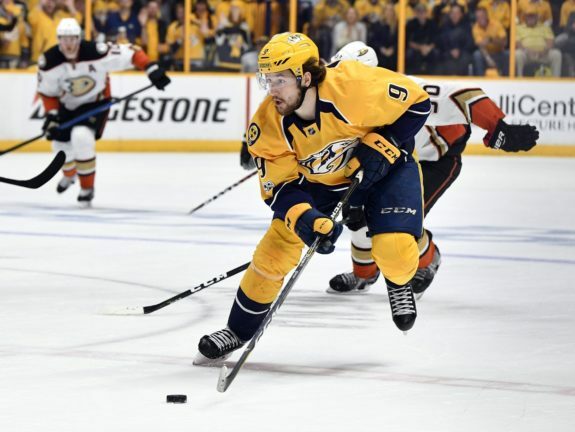 While the Predators added a bottom six winger, the rest of the powerhouses in the Western Conference geared up for a slugfest. Vegas added Tomas Tatar, a top-six scoring winger who will thrive with some real players around him. Winnipeg added Paul Statsny, who has 40 points in 63 games so far this season while playing in the Blues’ top six. He’ll be a welcomed addition behind Mark Scheifele and Bryan Little, as a good center corps just got better. In a league where Cup windows are fleeting, the Predators are gambling that their current roster can get it done.